If you have been hanging around here for a while, you know that I LIVE in jeans. I wear some kind of jeans and sweater or t-shirt variation on the daily. Jeans make me feel confident and work for my lifestyle. Also, I am a total sucker for a cute white shirt. 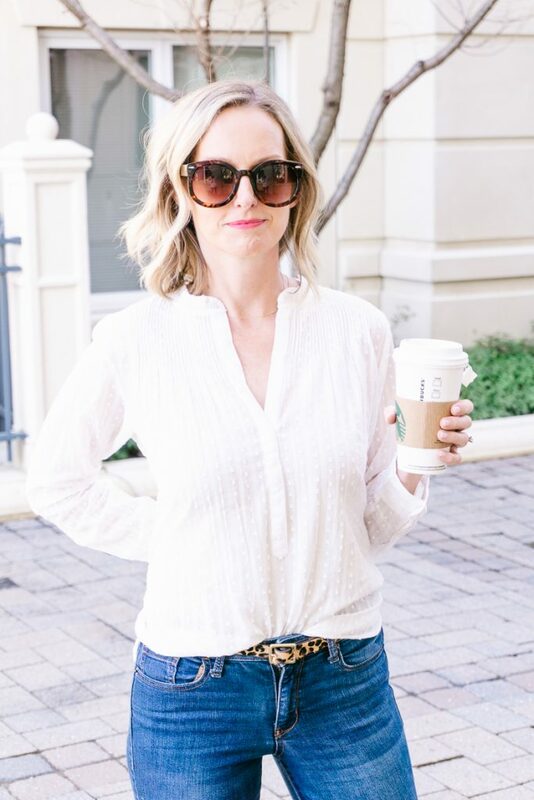 A killer pair of jeans with a white top has always been one of my favorite combos. I think it looks clean & classic and is almost always appropriate. I immediately fell in love with this cute white top. It is perfect for right now and is a bit dressier than a tee. I paired it with my trustee leopard belt and my new pink Rothys that I am obsessed with for spring. This is basically a signature outfit for me and checks all of the boxes. 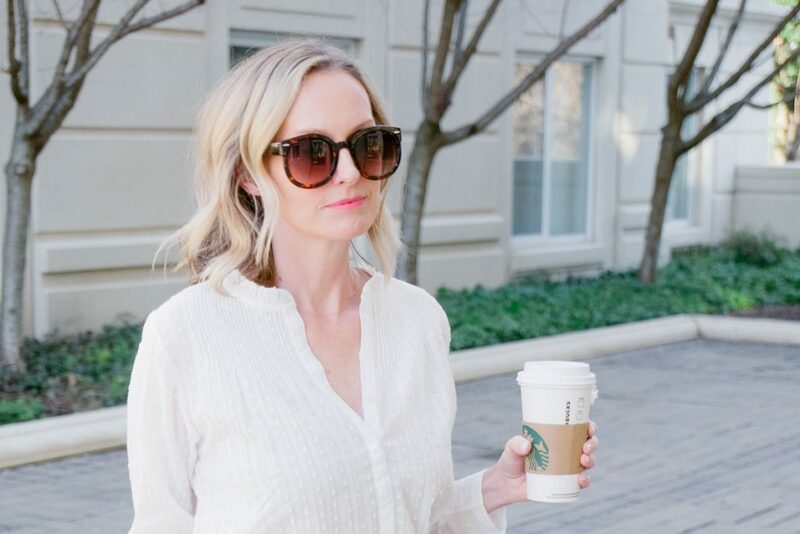 A good friend, who also happens to be personal stylist, once told me there should be 4 components that will add interest to every outfit and help you look fresh & put together. They are: Color, Pattern, Texture and Shine. If you ever have trouble putting together an outfit, think of it in terms of these 4 pieces and try to incorporate at least 2-3 into every outfit As you can see here, this does not mean you have to dress fancy at all. It works for every outfit and occasion. Why not give it a try sometime? You will be surprised how much easier is is to put together an outfit. The shirt is made from light wight cotton and the dots give me the texture I am looking for. Sadly, it is currently sold out in white, but I bet they will get it back in stock. I will keep you posted. This white top is also super adorable and I am currently obsessing over it. The leopard belt is a fixture in my closet and adds a touch of pattern and shine. It works with almost every outfit in my closet. These Rothys add a nice pop of color and are so comfortable. These are the only flats that actually stay on my feet. I have narrow feet and walk out of almost every flat I own. These stay put. I don’t know how, but they do. I also love that they are made from recycled plastic bottles and you can throw them in the washing machine. They are basically the perfect mom shoe. There are many patterns to choose from but the hot pink just spoke my language. I hope you guys have a good rest of your week. I have a super fun surprise coming your way this Friday, so stay tuned and make sure you are following me on Instagram.